I've been in Oregon for just over a month since returning from Montana and the Crow Indian Reservation. I had two goals in mind for this trip. First, I wanted to share the good news of the gospel through baptism. Second, I told myself I wasn't leaving the rez until I finished writing the manuscript for Love Your Guts Out. I'm glad to report that I had the honor of baptizing seven people and also completed the first draft. Thus, I left the rez and returned to Oregon. Now that I'm back in the Beaver State, it's time to determine what road to travel next. What I know so far is that my latest trip was also my final one along the literal Uttermost Road, at least in the foreseeable future. I say "literal" because I'm referring to life on the road towing a fifth wheel trailer. This day hasn't come unexpectedly. Without raising missionary support, I knew from the outset three years ago that the road would only go as far as my resources could take me. But metaphorically speaking, until the day I park it for good, the message of the Uttermost Road will continue: discover and explore the limitless depths of the River within you, then pour out your life like there's no tomorrow. You won't run dry . . . never! The Uttermost Road for me will simply take on a different look. If I had to do it all over again, I certainly would. The journey of traveling the Uttermost Road in a diesel pickup with trailer in tow has been personally transformational. The experiences and encounters along the way have been priceless and unforgettable. My hope and prayer is that the paths that I crossed opened the door a bit wider for others to also experience new life and personal transformation. In front of me now are several possible roads to travel. My immediate need is to find work and get some income flowing again. This might come by way of a ministry position or employment in the general workforce. I'm open to relocating most anywhere, though my preference is somewhere in the western half of the country . . . you know . . . within a few hour's drive of a trout stream! I want to thank every one of you for following my journey. Your support has been very encouraging and most appreciated. Though I'm signing off for now as a road warrior, I won't be signing off from the Uttermost Road website. It will undergo a revision and take on a new look, and I plan to continue blogging and return to recording and expanding the video teaching library. Please stay tuned. I'll be posting updates as details unfold. I'd love to hear from you. If you have comments, or perhaps suggestions about revising the blog, video teachings, employment opportunities and ideas, send them my way. After spending about a month in the Salem area visiting family, I've launched out once again on the Uttermost Road. Destination: Montana and the Crow Indian Reservation. But this time, the Uttermost Road could well be called the "Baptismal Road." Watch this video and find out why. This is my long over-due video update along the Uttermost Road! "Unpredictable" and "fluid" are suitable adjectives that describe the nature of the Uttermost Road. I had anticipated uncertain road conditions long before I actually set sail for the first time, some two and a half years ago. Even the decision-making process of taking this path was riddled with unknowns. Many still remain unsolved. This past fall, a big bend in the road led me to southern California. Except for two brief trips to Oregon via Southwest Airlines, I've been living in S Cal with my trailer parked at the foot of the San Bernardino Mountains. The journey to this part of the country, and then to live here for several months, wasn't in my original "plan" when I set out along the Uttermost Road. Now that I find myself in The Golden State, several questions as to my purpose for being here have yet to be mined and brought to the surface of my understanding. But had I not followed this road with all its uncertainties, I would never have experienced the blessings I've received or crossed paths with the people I now call my friends. Perhaps its more freeing to be carried along by the currents of the Wind than to remain tethered to self-made plans and "hell-bent" on pursuing a predetermined course. I'm beginning to believe that the ground of uncertainty is incredibly fertile soil for peace and abundant life to grow and flourish. Imagine that! Peace I give to you, but not the world's kind of peace. It's My peace. (John 14:27). I've come that you might have life and experience it abundantly (John 10:10). Each bend in the road is a vivid reminder of life's uncertainties. For me, every curve I maneuver in my truck with trailer in tow is an object lesson about my inability to see around corners and predict the future. However, I'm learning to live with this reality . . . the fact that I'm not in control . . . and to do so with a new measure of peace in the midst of unknowing, in the middle of what might otherwise cause stress and anxiety. The apostle Paul exhorts his readers in Philippians 4:6 not to be "anxious" about anything. Easier said than done, brother. Nevertheless, it's great advice. In fact, the only way I know how to deal with anxiety or to embrace uncertainty without fear, is to receive the embrace of the One who is prepared for every possibility. This One has already traveled down every conceivable avenue I might choose to trek . . . and waits there for me. I'm intrigued by the imagery here in The Message . . . "shape your worries into prayers." Exactly! And I like to think of prayer, not as mere verbal appeal to a higher power who needs to be persuaded, but simply as being present to the One who is always present to me and in me. I appreciate how Eugene Peterson powerfully states it in verse seven . . . "when Christ displaces worry at the center of your life." Christ displaces worry . . . yes! Think about it, it only takes one small flame to displace or remove the weight of uncertainty in an otherwise darkened room. When you feel overwhelmed by anxiety, be reminded that peace is within you because the Prince of Peace is within you. When waves of uncertainty lap up against you, be reminded that the One who calms the storm abides in you. When it feels like darkness has surrounded you, be reminded that the Light who has come into the world has come into you! Fear not . . . so LYGO! In my latest blog along the Uttermost Road, I share some observations and concerns surrounding the recent election, and then suggest a path forward from out of the smoke and rubble of the political battlefield and the lingering cloud of uncertainty. I'm aware of only one certainty in life. If you know me at all . . . Check out my latest video update from beautiful Wrangell, Alaska! I've been rather quiet on the blog since returning and wintering in Oregon for the past three months. Yet, it hasn't been totally uneventful. I've had three speaking engagements, made a trip to Indiana for a conference, and visited relatives in the Hoosier State that I hadn't seen in over two decades. The nature and direction of Uttermost Road continues to evolve and meander in new directions. This week, the road led me north to Alaska. This time, however, I didn't ride my iron horse with longhouse in tow. The "uttermost skies" was my pathway to Wrangell . . . a small town located on an island bearing the same name in SE Alaska. 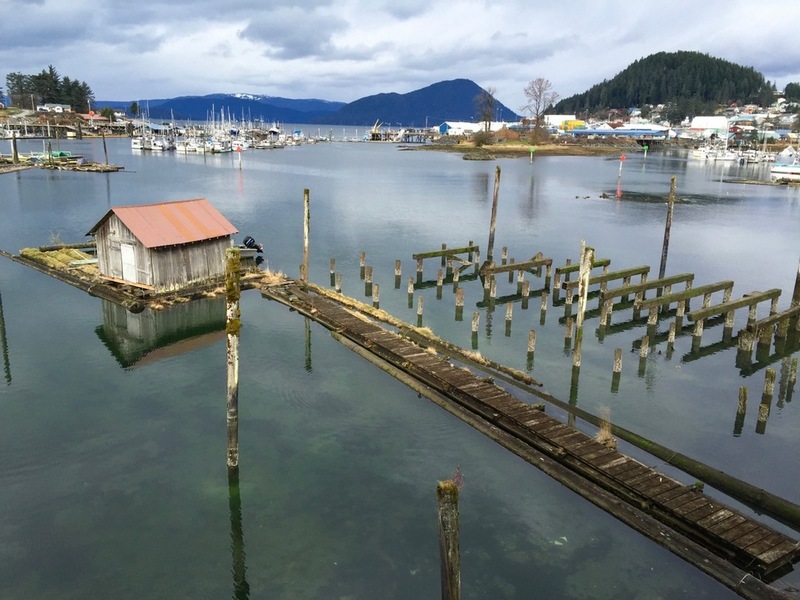 The borough of Wrangell is located on the northwest tip of Wrangell Island, approximately 150 miles south of Juneau and 80 miles north of Ketchikan. It's near the mouth of the Stikine River, a historic trade route to the Canadian Interior. Perhaps you're wondering, "Rick, why are you in Alaska and for how long?" If you know me at all, then you might conclude that I traveled to Alaska in pursuit of fishing experiences for various salmonids. That would normally be a logical conclusion. However, in this case, that would be incorrect. Though Wrangell is surrounded by waters teaming with salmonids and halibut, casting a line isn't the purpose of this trip. While on the road last summer, I was exploring ways of spending the winter months in something other than my trailer in the sub-zero temperatures of Montana. In the process, I discovered a small church in Wrangell without a pastor. So, the purpose of this trip is to visit for about a month as an interim pastor and hopefully offer encouragement and ideas about how the congregation might move forward in ministry. At this point, my intention is not a long-term gig, so to speak, though I am willing to extend my stay, if need be and so led. The reservation road still beckons, so how the path from here leads back to the rez remains to be seen. On the other hand, driving blind, as it were, might always be the case along the Uttermost Road. I have yet to develop the ability to see around the next bend in the road. "Pneumanauts" (sailors of the Spirit) seek to be led and moved by spiritual currents; they're cared for and carried by the Wind. I'll be casting my cares into the Wind whether or not I ever cast a line into these inviting waters. The beach along Zimovia Strait at low tide in front of "my house." As the ministry of Uttermost Road branches out, please consider becoming a partner with me. Your prayers are most appreciated, and I accept any and all forms of spiritual lifting and support. I'm especially looking for a few individuals who sense a stirring to pray. I'd like to hear from you and ask you to consider being part of my "spiritual support team," a group I can contact directly with specific prayer requests. A friend of mine posted this photo on Facebook recently and I wanted to share it with you along with my comments. Why, you might ask? Do I think Jesus actually looked like a blue-eyed hippie from a movement that bore his name back in the late 60s and early 70s? No, I don’t. He probably looked more like a Navajo or Crow than a white guy. It's the caption that really caught my attention! The reality is that underneath the skin we all look alike. So much so that Jesus looks like a commoner from every culture throughout the history of humanity. We can disagree as to whether or not Jesus looked anything like this fellow in the photo, but I believe the caption is absolutely true and accurate. He identifies with every one of us and will carry every dark secret and pain we keep concealed in our baggage. In fact, whether you realize it or not, Jesus has been carrying your baggage all along. The mystery of the cross has something to do with this mind-boggling truth. You don’t have to lug your "stuff" around isolated and alone. Choose Life and live unencumbered... and journey into freedom with a Companion who bears your burden and knows the way forward!